Santa Lucia is the only train station on the island of Venice. All trains reach the main station "Venezia Santa Luci" via a bridge over the sea, which is more than 3 kilometers long. Almost all trains stop also at Venice-Mestre station on the mainland. Venice Santa Lucia is a very large station with many departures. It's a terminus. 14 tracks are in a large station, some more tracks and platforms for regional trains can be found outside the concourse. A few hundred meters after the station, all trains take the four-track bridge towards the mainland. The next big stop is Mestre, a suburb of Venice. Mestre now has more inhabitants than the island of Venice with the old town. A train ride from Santa Lucia station to Mestre station takes about 10 minutes. From the Venice Santa Lucia train station there are both long-distance and local trains. After Mestre station, the trains continue in various directions. There are frequent connections to Verona, Bologna and Trieste. The fast Eurostar and IC trains run for exmple to Rome (via Bologna and Florence) and to Milan.. There are also direct trains to Munich (Germany) and other cities abroad. The daily EC 86 is popular leaving at 13:50 via Verona, the Brenner and Innsbruck to Munich (arrival 20:25, as of 2019). On the island of Venice, only a very small area is accessible by car and the parking fees are very high. Venice is therefore probably the only major city in Europe to which transport is mainly provided by public transport. Venice is served not only by trains but also by buses and trams, which stop just a few minutes walk from Santa Lucia station at Venice bus station. Venice also has only one bus and tram stop at Piazzale Roma square. From Santa Lucia station there are about 6 to 10 local trains per hour to Mestre during the day. Many tourists book a hotel in Mestre, because hotels in Venice are very expensive. In the season many thousands of holidaymakers per hour (!) often use the local trains. These trains are often very crowded in the morning towards Venice and in the late afternoon and evening towards Mestre. The same applies to buses and trams. To our knowledge, all local trains leaving Venice Santa Lucia station stop at Mestre. So it doesn't matter which train you board at Venezia Santa Lucia as long as it's not a fast train like a Eurostar or Intercity. It is not always easy to buy tickets abroad. You don't know where to buy tickets, foreign ticket machines are difficult to use, there are language problems, queues, etc. 1. The 1, 2 or 3 day valid tickets for the waterbuses (ferries) in Venice are needed by almost every tourist. These tickets can now be bought on this english website. 2. The tickets for the bus from Venice airport to the city (8 Euro single or 15 Euro round trip in the year 2019) are available on this page in English language..
A ticket by train from Venice to Mestre costs only 1.25 Euro (as of January 2019). Often it is not easy to get a ticket. The reason is the long lines at the machines and counters. There are at least 20 ticket machines in Mestre station and Venice station. In addition, there are always 5 to 8 counters at both stations. However, this is often not enough. We waited more than 30 minutes in line at the ticket machine in Mestre in October (not in the high season!). 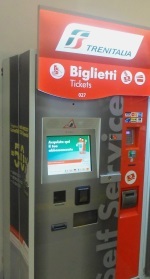 About half of ticket machines in Italy only accept credit cards and no cas. Lonter queues usually form at machines with a cash function. Most tourists do not want to pay 1.25 Euro with a credit card. The prices at railway stations in Italy for a sandwich or a Coke to go are high. Venice is the most expensive city in Italy, this also applies to the prices in the train station. We have never seen a Coke 0.5 litre (bottle to go) for less than 2.50 Euro. If you can, you should definitely buy something to eat or drink before or outside Santa Lucia station. But also the surroundings of the main station of Venice is not exactly inexpensive. Normal prices has Burger King in Venice. Cross the large bridge over the waterway Canale Grande (turn left after leaving the station). At the other sid of the bridge you almost stand in front of the entrance of the Burger King. 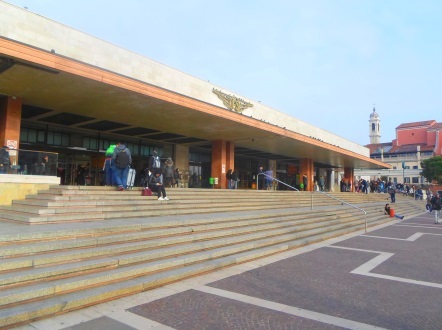 As we said, Venezia Santa Lucia station is a big station. There are also many shops, the rain station is a small shopping centre. 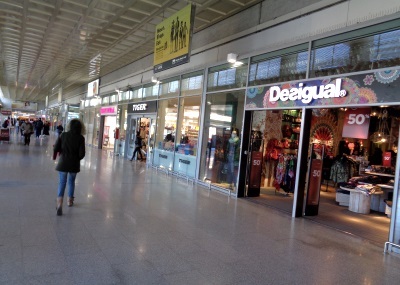 Some examples of shops: Desigual, Tally Weijl, Boggi Milano, Z Generation (baby clothes etc. ), L'Occitane (perfume etc. ), an exchange office and a ticket dealer. The station is not far from the bridge from the mainland to Venice. The majority of tourists walk from the main railway station through Venice. We estimate the following walking times to the important destinations: Rialto Bridge about 25 minutes, Piazza San Marco (St Mark's Square) about 45 minutes, Accademia Gallery 30 min, Guggenheim Collection Venice 35 minutes. Venice is a labyrinth of small alleys. Even with Google Maps on my mobile with GPS in my hand, I still get lost, although I know Venice well by now. If you don't have a smart phone, you need a damn good map. The other option is the so-called vaporetto, the only public transport on the island of Venice. They are water buses (ferries). Many lines stop at Santa Lucia station ("Ferrovia"). Departures to Rialto and San Marco (St Mark's Square) are every few minutes. The bus stop for the water buses is 20 metres from the main exit of Santa Lucia train station. There's only one big catch: the fare. Venice is expensive, the water buses are the best example. A single ticket costs 7.50 per person, a day ticket 20 euros. A family with 2 bigger children pays for a trip to St Mark's Square and back (distance 2-3 kilometres) 50 euros or more. For that you get a small standing place on a crowded ferry. For this reason, most tourists probably walk through Venice. Taxi: If you have more money, you can also take a comfortable water taxi (see: Water taxis in Venice). Many tourists have forgotten one thing when planning their holidays. How do you get to the hotel from Santa Lucia station with the heavy suitcases? There are no buses or taxis because there are no roads. With a bit of luck, a water bus (vaporetto) will take you nearby yout hotel. Then the trip costs "only" 7.50 euros per person one way. If not, there are basically three possibilities. The suitcases are dragged for miles around Venice, including many steps up and down. 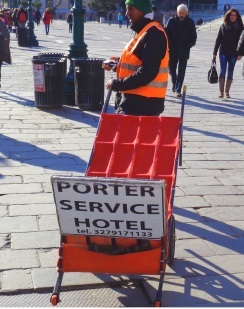 You take a rather expensive water taxi (taxi ship) or you pya for a porter. These young strong men are waiting outside the station for customers. However, there the porters are no bargains. They have a trade union and have fixed prices. You should always ask for the price first. Another advantage of the luggage carriers with sack truck is that you do not have to find the way to the hotel yourself. Just follow the porter. We advise most holidaymakers to book a hotel at Booking.com on the mainland and travel to Venice every day by train or bus. Theoretically, you can also choose accommodation near the Santa Lucia train station. The problem is that the hotels here are very expensive. A simple room around Santa Lucia station can quickly cost 200 euros or more. Almost every holidaymaker wants a room next to Venice's main train station. Supply and demand determine the price. Venice attracts 20 million tourists a year.